Below you fill find all funeral homes and cemeteries in or near Toms River. Popular neighborhoods in Toms River include: Chadwick Beach Island, Silverton, Gilford Park, Dover Beaches North, Dover Beaches South, Toms River (CDP), and Central Jersey. Suburbs of Toms River: Berkeley, Berkeley Township, Berkeley Twp, Dover Township, Dover Twp, S Toms River, South Toms River. Their current mayor is Mayor Paul J. Shives. Zip codes in the city: 08753, 08754, 08755, 08756, 08757. The Michael Hegarty Funeral Home began in 1975 to serve the Old Bridge Community and its surrounding areas. From our original location, we offer more than 30 years experience as a full-service funeral home that serves all faiths. e of the local funeral shops we partner with. There are currently 15 funeral options for this city. Some of the notable people born here have been: Brian Geraghty (actor and film producer), Darian Barnes (american football player), Mike Bucci (wrestler), Chris Konopka (football player), Al Leiter (baseball player), Leigh Lezark (model), and Keith Stokes (american football player). 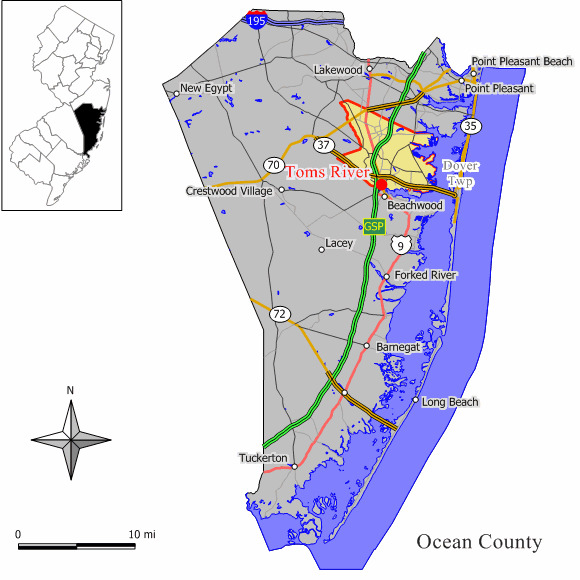 Toms River is a township in Ocean County, New Jersey, United States, and the county seat of Ocean County. On November 7, 2006, voters approved a change of the official name from the Township of Dover (or, Dover Township) to the Township of Toms River, effective November 14, 2006. As of the 2010 United States Census, the township had a total population of 91,239, with the township ranking as the 8th-most-populous municipality in the state in 2010 (after having been ranked 7th in 2000) and the second most-populous municipality in Ocean County (behind Lakewood Township, which had a population of 92,843). The 2010 population increased by 1,533 (+1.7%) from the 89,706 counted in the 2000 Census, which had in turn increased by 13,335 (+17.5%) from the 76,371 counted in the 1990 Census.What is now Toms River Township was established by Royal charter as Dover Township on March 1, 1768, from portions of Shrewsbury Township, while the area was still part of Monmouth County. Dover Township was incorporated as one of New Jersey's first 104 townships by an Act of the New Jersey Legislature on February 21, 1798. Portions of the township were taken to form Jackson Township (March 6, 1844), Union Township (March 10, 1846, now Barnegat Township), Brick Township (February 15, 1850), Manchester Township (April 6, 1865), Berkeley Township (March 31, 1875), Island Heights (May 6, 1887), Lavallette (December 21, 1887) and Seaside Heights (February 26, 1913).In 2006, Toms River was ranked by Morgan Quitno Press as the 15th safest city in the United States, of 369 cities nationwide. In 2007, Toms River was again ranked as the 14th-safest city in the United States of 371 cities nationwide.Toms River can be seen in various TV and news media including MTV's Made and Jersey Shore (seasons 1,3,and 5), HBO's Boardwalk Empire and the original The Amityville Horror movie. In 1998, Toms River East Little League won the Little League World Series. The township has what is said to be the second-largest Halloween parade in the world. It was written by Sarasota Herald-Tribune on December 6th, 2018 that Michael Christopher Balch died in Venice, Florida. Balch was 49 years old and was born in Toms River, NJ. Send flowers to share your condolences and honor Michael Christopher's life. It was noted by Sarasota Herald-Tribune on October 24th, 2018 that William Joseph James passed on in Sarasota, Florida. James was 72 years old and was born in Toms River, NJ. Send flowers to express your sympathy and honor William Joseph's life. It was disclosed on September 8th, 2018 that Dorothy Mae Parsons (Mueller) passed on in Toms River, New Jersey. Ms. Parsons was 90 years old. Send flowers to share your condolences and honor Dorothy Mae's life. It was revealed on August 12th, 2018 that Anne S Burgan died in Toms River, New Jersey. Burgan was 83 years old and was born in New York, NY. Send flowers to express your sorrow and honor Anne S's life. It was noted on April 17th, 2018 that Lorraine R Fastuca (Timoney) passed away in Toms River, New Jersey. Ms. Fastuca was 90 years old. Send flowers to express your sympathy and honor Lorraine R's life. It was reported by Eau Claire Leader-Telegram on December 10th, 2017 that Dan G Shargas passed on in EauClaire, Wisconsin. Shargas was 92 years old and was born in Toms River, NJ. Send flowers to share your condolences and honor Dan G's life. It was reported on October 20th, 2017 that Herbert O Joachim perished in Toms River, New Jersey. Joachim was 85 years old. Send flowers to express your sympathy and honor Herbert O's life. It was written on March 15th, 2017 that Brue Edward Haldeman perished in Melbourne Beach, Florida. Send flowers to express your sympathy and honor Brue Edward's life. It was disclosed on March 14th, 2017 that Mary Gonzalez (Gruno) died in Toms River, New Jersey. Ms. Gonzalez was 94 years old. Send flowers to share your condolences and honor Mary's life. It was disclosed on December 1st, 2016 that Alvin E Jr Clayton passed on in Tampa, Florida. Clayton was 86 years old and was born in Toms River, NJ. Send flowers to express your sympathy and honor Alvin E Jr's life. Funeral homes in Toms River also provide the funeral needs for pets.
. In terms of population, Tom River ranks seventh largest when it comes to its population. in fact, the city had been used for several movies and TV series and shows. Toms River is located in Ocean County and is one of the State of New Jersey's fastest growing cities. With the number of funeral homes and services in the city, its residents would not be having any hard time choosing for a good one. The official website for the city of Toms River is http://www.tomsrivertownship.com/. Funeral services were held on October 17 at the R.J. O ... and a sister, Margaret LeDlanc of Toms River, New Jersey. Visitation will be held from 7 to 9 p.m. Tuesday, at Kedz Funeral Home, 1123 Hooper Ave ... In lieu of flowers, contributions to SolAmor Hospice, 1415 Hooper Ave., Suite 203, Toms River, NJ 08753. Funeral Homes and cremation services in the Toms River NJ area. We work with local florists and flower shops to offer same day delivery. You will find budget sympathy flowers in Toms River here. Our funeral flowers are cheap in price but not in value.